You’ll be driving along depressed when suddenly a cloud will move and the sun will muscle through and ignite the hills. It may not last. Probably won’t last. But for a moment the whole world comes to. Wakes up. Proves it lives. It lives— red, yellow, orange, brown, russet, ocher, vermilion, gold. Flame and rust. Flame and rust, the permutations of burning. You’re on fire. Your eyes are on fire. It won’t last, you don’t want it to last. You can’t stand any more. But you don’t want it to stop. It’s what you’ve come for. It’s what you’ll come back for. It won’t stay with you, but you’ll remember that it felt like nothing else you’ve felt or something you’ve felt that also didn’t last. Our recipe for autumnal boozy yumminess is basic: apple cider and rum (with the occasional cinnamon stick for garnish). It’s a warm drink that’s cozy and comfortable and great to drink out around the firepit on a chilly night. I hated apple cider for way too long, because I only ever had it cold. Hot cider was a revelation. Smooth on the tastebuds, warm in the chest, and then satisfying in the belly. I poked around the interwebs to see if this concoction had a name. It does: hot cider with rum. 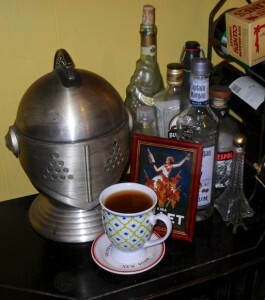 Most recipes seem to call for the heating on the stove of rum and cider, plus some variation of a mixture of cloves, orange slices, cinnamon sticks, nutmeg, and/or allspice. Emeril Lagasse has a decent-sounding recipe on his site here. Maybe we’ll try that next time. For now, we had some local apple cider from Brace’s Orchard in Dallas, PA and some Kraken Black Spiced Rum, so we threw them together and microwaved. Cozy afgan in the first picture courtesy of my darling mother in law. It’s the perfect combo with this drink on a chilly night. 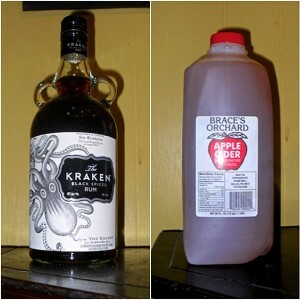 Oh, and you know we’re keeping that Kraken bottle forever. Combine 1 microwave safe mug of apple cider to a shot (approx. 1 oz.) of rum....or 2 shots, depending on how much time you have on your hands to waste. Microwave for 1- 2 minutes per mug. 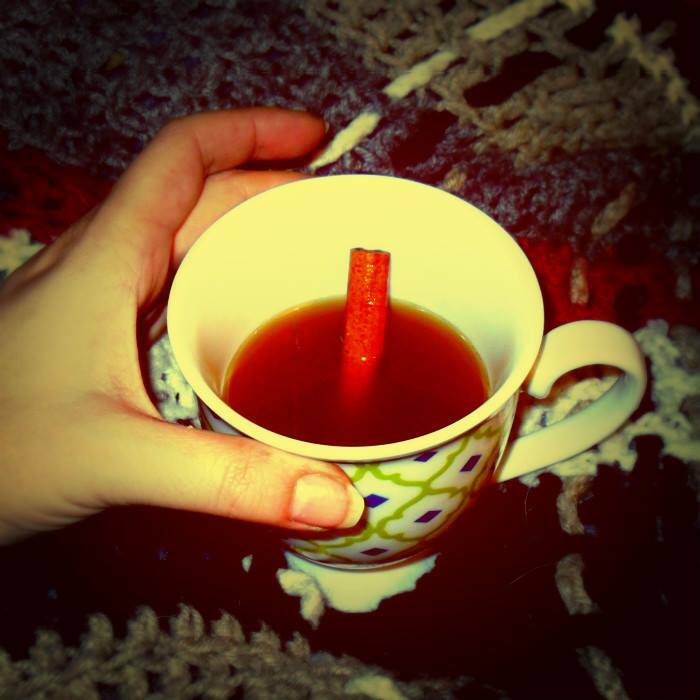 Throw one cinnamon stick into each mug-ful after heating to release even more flavor into this drink. Serve and sink into the relaxing warmth. Hello Fellow Food Enthusiasts! I am the East Coast Representation of Cast Iron & Wine. I'm a married gal in my late 30's, living in northeast Pennsylvania. The hubbs is really the one who does most of the cooking and experimenting, so I will mostly be describing his recipes and the results (good or bad). I will call him "M", like Moriarty. Expect Anthony Bourdain-level snark whenever possible from both of us. We only kinda became foodies in the last few years, so many many tastes are new to us. My posts fall mostly in the "what NOT to do" category, but I'm learning. I'm so excited that we have a venue like this to share food experiences! Try adding some Whalers Vanille Rum ..
Had this at a restaurant in Ohio years ago and I’ve made it every fall since. I was distracted by the drink recipe. Thanks for the recipe and the plug! 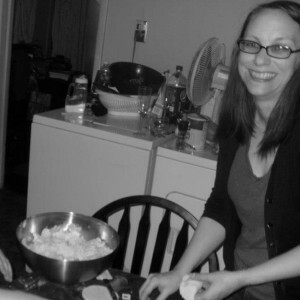 Bridget K Fulkerson, your afgan makes an appearance in this post!